PORTLAND -- Despite resting three of their starters, the Denver Nuggets gave the Portland Trail Blazers all they could handle in the second game of a Northwest Division, home-and-home series. Eventually, Portland managed to get it handled. The Trail Blazers outscored the Nuggets 17-3 in the final 3:55 of regulation to come away with a 115-108 victory in front of a sellout crowd of 19,890 Sunday night at the Moda Center. "It wasn’t pretty but I really liked the way we finished," said Trail Blazers head coach Terry Stotts. "We made a lot of energy plays in the last two to three minutes to pull away. I thought Denver played with a lot of energy. Their second unit plays really well. They play hard together, they made some shots, I thought they outworked us for a good part of the game, especially in the second half. They got energy plays, the offensive rebounds, things like that, but we made the plays when we needed to down the stretch." Portland is now 51-29 overall and 31-9 at home this season. The Trail Blazers have now won their last seven games at the Moda Center and are 9-2 in their last 11 overall. The win also snaps a six-game losing streak to the Nuggets, though Denver had already secured the season series thanks to winning the first three meetings. With the win, the Trail Blazers remain in fourth in the Western Conference standings with two games to play. Portland needs one win or a Utah loss in the final two games of the season to ensure homecourt advantage in the first round of the Western Conference playoffs. "We had (homecourt) last year and we lost (the series), that doesn't take away from the fact that it was still to our advantage," said Damian Lillard. "We started on our home floor and I think a lot of teams want that because if every teams wins every game on their home floor, we'll win that series, we'll have more games than the other team. So I think that's what the goal is of having homecourt. But what we learned last year is that doesn't guarantee you're going to win the games at home. But that doesn't mean you don't fight for that position." The Nuggets, despite Nikola Jokic, Paul Millsap and Jamal Murray all sitting out due to "load management," took the fight to the Trail Blazers in the early going. Denver jumped out to an early 12-4 lead, thanks mostly to Gary Harris scoring eight points in the first four minutes. 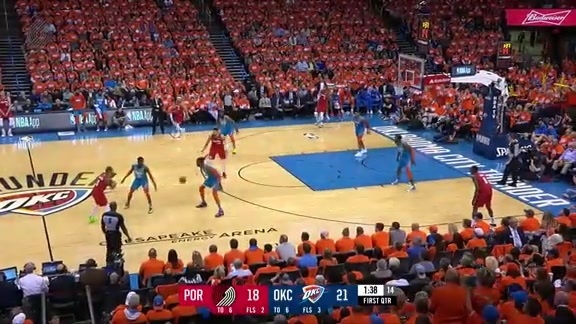 Portland would eventually get their legs under them, going on a 23-9 run to take a 27-21 lead before Denver shaved that down to 29-25 going into the second quarter. The Trail Blazers got a boost in the second quarter from Seth Curry, who missed the previous matchup on Friday with left tibia soreness. Curry went 4-of-6 from the field to score nine points in the quarter. Behind Curry, Portland led by as many as 14 before going into the half with a 60-49 advantage. Both teams returned to their first-quarter play in the third, with the Nuggets shooting 58 percent from the field and 57 percent from three while the Trail Blazers struggled to make shots and hold on to the ball. It went from bad to worse for the Blazers in the fourth, the Nuggets outscoring Portland 24-10 in the first seven and a half minutes of the quarter to take a 105-98 lead. At that point, it looked as though the Trail Blazers' chances of starting the postseason at the Moda Center were about to decrease dramatically. 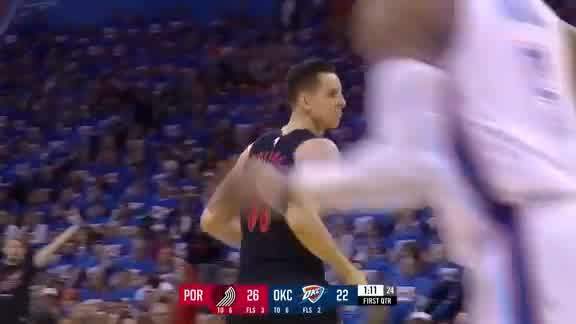 But then Lillard earned a trip to the line after being fouled on a three-point attempt, Al-Farouq Aminu got a tip-in and a block that led to a fastbreak layup for Enes Kanter that gave Portland a 109-106 lead. 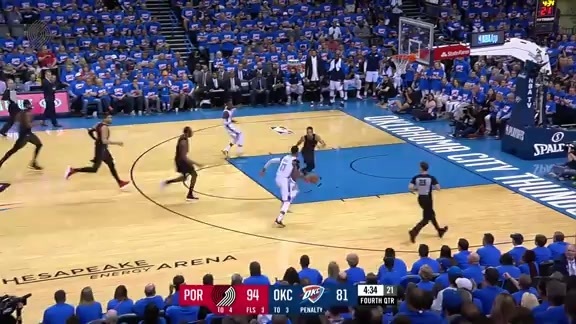 Aminu would get another block, two free throws and a reverse layup in the next minute and a half to push the advantage to eight with just under a minute to play, which would be enough of a cushion to come away with their 51st victory of the season. The Trail Blazers were led by Lillard, who went 9-of-19 from the field for 30 points to go with six rebounds and five assists in 37 minutes. It was his 27th game this season with at least 30 points, matching the most games of at least 30 points he has had in a season in his career. Lillard also set a new career high in points for a season with 2,047 and set a new franchise record for three-pointers in a season with 234. Aminu tied his season high with 23 points and also grabbed 11 rebounds for the double-double. 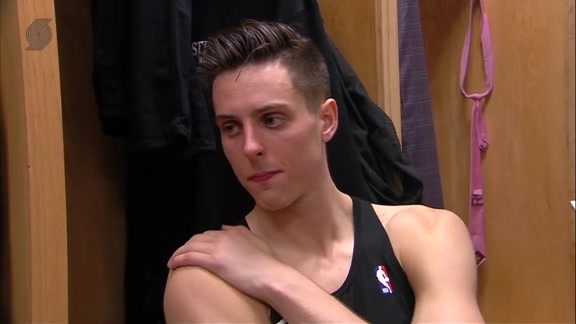 The 6-9 forward made multiple clutch plays down the stretch that were crucial in Portland coming away with the win after trailing by as many as eight points in the fourth quarter. Rodney Hood, Curry and Kanter all finished with 11 points, with the latter also grabbing 13 rebounds for his fourth double-double in his last five games. CJ McCollum returned to the lineup after missing the last 10 games with a popliteus strain in his left knee. The 6-4 guard out of Lehigh started and played just under 25 minutes, finishing with 0 points on 3-of-13 shooting, six assists and six rebounds. "I felt like I was moving pretty well, felt like my conditioning was in pretty good shape," said McCollum. "Just tried to play the game." Six Nuggets finished in double figured led by 18 points from Gary Harris. Trey Lyles and Malik Beasley each added 15. Next up, the Trail Blazers begin a season-ending back-to-back starting Tuesday night versus the Lakers in Los Angeles. Tipoff is scheduled for 7:30 p.m.